« The Maker’s Mark® #ShareDelicious Holiday Tour! Tis the season for Pappy Van Winkle. Join us for a tasting of Pappy Van Winkle Bourbon, one of American’s most sought after spirits. We will offer the very rare & beloved wheated bourbon to guests alongside careful pairings of food during this unique dining experience. Secure your tickets fast as seating is very limited. This exclusive dinner will feature a mouth-watering five course prix fixe menu created and prepared by Chef Austin Luchon of The J Parker. Beverage Director Kolin Juckins spent the last year obtaining these rare bourbons for this one night only event. Both Chef and Beverage Director carefully worked to provide a menu fit for highlighting the flavors and aromas of both the bourbon and the food. 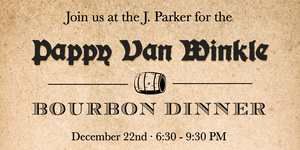 Each attendee’s ticket will cover the dinner, a 1oz pour of each Pappy Van Winkle age statement, and a brief overview highlighting the history of the Van Winkle Family lead by Beverage Director Kolin Juckins!